If you want to learn about automotive units properly, you need to focus on practical tasks. But the practical tasks are supported by theories. That’s why you need books that discuss different sides of automotive units. Without the help of books, it’ll be tough for you to learn different automotive repairing tasks. If you don’t have books, you have to find a teacher from whom you can practically learn. This might be tough for you. In this case, books of automotive structures and repairing are the best support for you. There are many auto mechanic books available in the market. Among those, choosing the best auto mechanic book is tough, but not impossible. The thing is different books are useful from different perspectives. So, choosing the best from different categories is a bit difficult. However, I have chosen a few books that can be called as most supportive books for automotive repairing. The books were selected focusing on the covered areas, reader-friendly or not, topics discussed and some other related issues. So, I hope you’ll find the appropriate book for you from the list. If you are a beginner and eager to go through a wide range of information about auto body repairing and maintaining, this book is one of the best auto mechanic books which can help you. The content span of this book is huge. From the basics to details, it covers almost all the things. It helps you to increase skills and know procedures so that you can achieve success as an automotive technician. If you are a car owner, this book will help you to know the basics comfortably so that you can perform the basic repairing at your garage on your own. This book is a market leader of auto mechanic book segment because of its content depth and description structure. It helps you with the information about working with both hybrid and electric vehicles. It also covers the area of coloring and cutting with detailed information. So, you are getting all the information about automotive vehicle body. A major portion of this book covers repairing after a collision. Starting from the damage estimation to repairing and refinishing, this book has discussed every detail. With the update of editions, this book becomes rich in information about the latest technologies, innovations and trendy practices of the industry. It helps you to remain stick to the latest developments and ideas. It is specially written for the beginners. As a beginner, you’ll find it easy to go through the book and get the knowledge properly. So, working vehicles will be more fun to you. Coming with thoroughly described contents and colored illustrations, this guide will allow you to prepare yourself as a master in auto repairing. Being written by an experienced automotive teacher, this book is a gem if you want to know about automotive repairing. It covers all areas of automotive repairing and maintenance. If you want to build a successful career in automotive repairing, this is one of the best auto repairing books to support you. Starting from inspection, it includes all the tidbits of maintaining and repairing of a damaged automotive vehicle. In a word, it is an all in one book that comes with everything you need to know to build yourself as an automotive mechanic. It also helps the vehicle owners too. If you want to learn about the do’s and don’ts of automotive vehicle maintenance, basic repairs that can be done at home and estimation of damages after a collision, this book can be a good helper for you. With the changes of editions, this book comes with new information and processes that can help you. As a result, you’ll always become in touch with the developments in the related industry that you must know to shine in your automotive career. Though an expert has written the book, it comes with the easy and detailed description of repairing and maintenance tasks. As a result, if you have only the minimum basics of automotive vehicles, you can easily understand and perform the tasks. If you don’t know anything about automotive vehicles, still this book can help you by providing the basics. Learning from this book means learning from a teacher. After getting the basics as well as details, what’s more, do you need? This book is great support for you if you are interested in learning things about engines. This book comes with information about different types of engines and operations on those. Besides, it also discusses the diagnosis, repair, and rebuilding of the different types of engines. This book is useful for the people who want to know the basics and essentials of automotive engines. Thus, automotive vehicle owners can gain enough knowledge about basic troubleshooting to lessen the cost of a technician when the engine faces a basic problem. If you are interested in building your profession in automotive engineering, this book can help you too. It comes with the techniques and knowledge that you need to support yourself in this field. It contains different valuable techniques and real-life case studies. These will help you to increase your practical knowledge besides theoretical knowledge. It contains the information described systematically and colored pictures marked specifically. As a result, you can easily understand what it says. Besides, you can relate the theories described and illustrated with the real scenario of your car engine. With the upgrade of engines and repairing techniques, this book comes in new editions that include the latest technologies and techniques. As a result, if you get the latest edition of the book, you’ll find the latest tracks of automotive engine industry. Overall, this book is a whole package of everything you need to know about engines which comes in reader-friendly condition. Besides, it offers you the latest developments on the field. So, if you are interested in automotive engines, you can take a copy of it. If you want to know the fundamentals of automotive technology, this book can be a good choice for you. It is specially designed and written focusing on the people who want to build a strong foundation in automotive systems. The book that provides basics should be reader-friendly and thoroughly descriptive. It comes with these two characteristics. As a result, you can easily read the book and understand what is written in it. Thus using the knowledge in the practical field will also be easy for you. Most of the information available in the book is applicable to all types of automotive vehicles. As a result, you won’t have to search for the specific information for the specific model that you use. 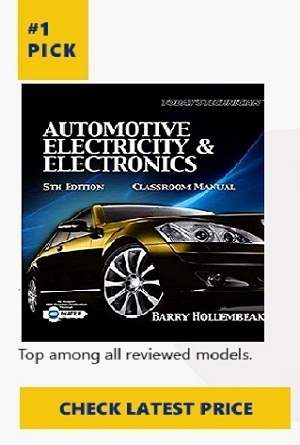 The book presents automotive systems through detailed and easy descriptions. So, if you are only a beginner with almost no knowledge of automotive, you’ll understand what the authors have tried to explain. It explains almost all the things- the basic functions, what the need is and what does it do- of almost all the single components. Thus it allows you to gather knowledge of the deepest things. With the improvement of automotive technology, this book offers you a new edition that includes the updated technologies and procedures. For example- the eleventh editions come with hybrid drive technology, direct gasoline injection, etc. which were not described in the tenth edition. As an auto mechanic book, it is a helpful, information-rich and easy read. So, I think you should go through it no matter you are a beginner or vehicle owner. All you need is the interest in automotive repairing. This book comes targeting the professionals or engineers who are eager to know how the electronics in an automotive system works. So, this may not be an appropriate book for beginners. If you have basic knowledge about the automotive system and commons tidbits of it, you can go through this book to learn more. It contains topics on both mechanic level electronics and professional level electronics. Besides, the latest editions cover different hot topics of recent times. Thus this book will educate you about the electronics that you need to know to improve your skills. As a result, you can prepare yourself for better automotive related job opportunities. As it discusses things from an engineering perspective, almost all the content contain supporting mathematical calculations and statements. As a result, you may think it is tough for them who are weak in math. But all the mathematical models are also described through a qualitative explanation that makes it easy to understand. So, basic mathematical knowledge will be enough. This book is a great support for the system engineers, control engineers and electronic engineers in an automotive system. It supports both beginner and professional engineers as it contains almost everything, from the simple automotive electronic circuit to the latest development in the field. Overall, this book is a great source of knowledge about automotive electronics as it comes with deep contents in this stage. As most of the models of this book are supported by the mathematical system, those are more dependable than models from other books. So, if you think that you want to learn about automotive electronics, don’t forget to choose this book. For a person who starting vocational training, this book by an experienced author is probably the perfect choice. Starting from the beginner level automotive services, it includes many professional level information too. As a result, if you want to start your career in automotive servicing industry, this book can be a great support for you. In this book, you’ll find all eight areas in which automotive repairing can be done. Thus it will show you which areas you need to cover for being a professional in automotive repairing works. All the chapters come with the skills and procedures you need to know to be successful in this field. For easy understanding, the topics of the book are divided into short chapters. It clearly identifies the differences between the topics and areas. As a result, you can easily focus on a specific topic and finish it within a short period of time. It also supports you to keep track of the topics you have finished studying. The book is designed to keep the readers in touch with the latest technology and trends in automotive repairing field. It contains detailed visual contents that make learning easy and effective. You can take help of those visual contents when you perform the tasks practically. To make sure that you are getting the knowledge that can be used in the practical field, the book keep the topics related to the ASE areas and NATEF tasks. In new editions, the latest inventions of that time in this sector are included. Overall, if you want to learn automotive servicing without going to a teacher, this book may help you a lot. The name says it all- the book is focused on making the readers familiar to the latest technologies, developments, tricks, and processes of the automotive engine industry. That’s why it comes with the name ‘Today’s Technician.’It mainly focuses on the automotive engines and the performance you get from those. It is appropriate for teaching in the classrooms that provides vocational training on automotive engines. Besides, if you want to learn about automotive engines working at your garage workshop, the book won’t disappoint you. As written for the learners, this book comes with easy English and detailed description of each of the topics. The book follows the latest NATEF tasks. Thus, it covers all the major areas that have a direct impact on the durability, performance, and efficiency of the engine. Thus, reading the book properly will allow the readers to know the main reasons behind the ineffectiveness and inefficiency of the engines, including- automatic engine controls, intakes, exhausts, fuel ignition, and other major reasons. The Classroom Manual version of the book is mainly for use in classrooms in which the main focus is on theoretical illustration. On the other hand, the Shop Manual focuses on the process, tool, testing, and service portion or practical part. Depending on the purpose, you can choose one or both. No matter which version you choose, you’ll get the latest technical information that fits your tasks. As a result, you can keep in touch with the recent innovations in this field. If you want to be a regular, this will be able to help you a lot. This is one of the oldest but still important books in the automotive industry. Being written before 1980, this book contains a wide range of information about automotive units available at that time. As those were simple in structure, this book can be used to know the basics of today’s complex automotive units. The book was written with a view to providing the answer of three basic questions about automotive units- how to design, how to build and how it works. The answers were given in a very easy and simple way so that the readers can easily catch the knowledge. To help the reader to understand quickly, the book is divided into different units. The starting of each unit is the basic theory depending on which the unit works. The basics are followed by other information provided one by one maintaining a specific order. This system takes the readers through a process that helps them to understand the whole thing step by step. After describing how the unit is completed, it describes how it works and how it contributes to the car. To make the description clear and understandable, this book contains a lot of pictorial presentation of the units and procedures. The pictures illustrate the related functions and parts. Important parts and areas are highlighted to get better attention than normal. A great feature of the book is the dictionary of Automotive Terms that is attached to the back of the book. It helps the reader understand the terminologies used in the automotive sector. Overall, this book is a perfect guide if you want to know the fundamental structures of automotive units, especially the units designed before 1980. The effectiveness of a book mostly depends on the situation of the reader. The books mentioned above are full of information. All you have to do is read thoroughly and learn things. I hope the books will help you to grow yourself as a professional in automotive repairing. If we missed a book that could have been on this best auto mechanic book review list, please leave a comment below or send us an email to thegaragely @ gmail.com and we will review it and add it to the list.